I don’t expect Apple or any developers to change their UI for this, because most of them actually still keep a lot of tap targets and menus on-screen. There are certain apps like Paper and Procreate that rely a lot on multi-touch gestures, but those are apps that I would not expect to use with a mouse anyway. They really are better with touch to begin with. However, I’m excited by the prospect using my Magic Trackpad or Magic Mouse with the iPad Pro. It actually makes a lot of sense to me. It would be great for browsing at the desk, or editing long articles. Then there’s Split View, which could benefit greatly from the flexibility of a pointing device. One second I could be on the right side of the screen highlighting text on a webpage, and then the next second I would click in Evernote (open on the left side of the screen) and just paste the text with a keyboard shortcut. A really fast operation that’s common on the desktop, but which would be enabled by the addition of a pointer on the iPad. I don’t just want this for convenience though. 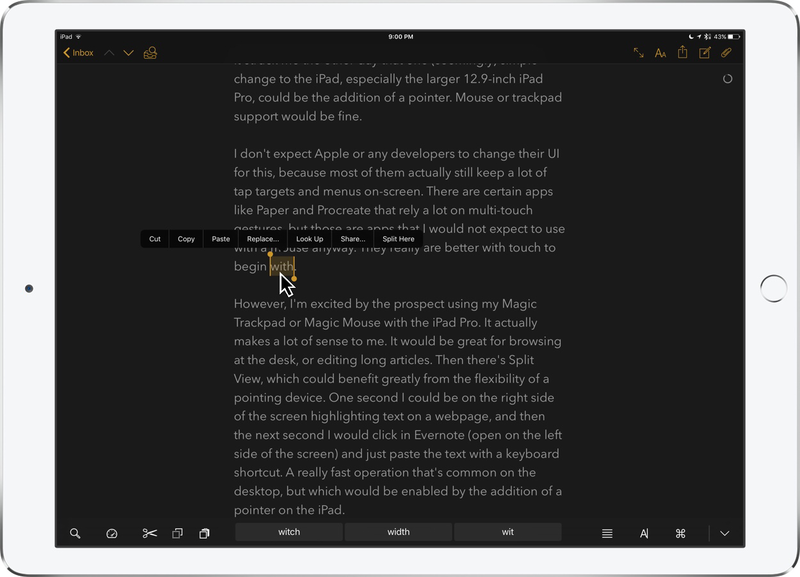 As I’ve stated before, I do think there is a fundamental flaw with long-term work on the iPad. If you stay in front of the screen for 2-3 hours, it can be tiring to keep tapping on controls along the top of the screen. A pointer could save me from having to move my arm up and down the screen. Not every app would embrace a software update like this, but that’s all right. The iPad Pro is almost always marketed with the Smart Keyboard, and the majority of apps that I own have not added keyboard shortcuts or made themselves more keyboard-friendly. I think pointer support on iOS would be received similarly, and once again — could take advantage of accessories that people probably already own. There are times when I find it refreshing to return to my Mac for a few days, just because its features and apps are far more accessible when sitting at a desk. Everything is within easy reach with a combination of keyboard shortcuts and a sensitive trackpad. I think the chances of adding mouse or trackpad support to iOS are slim, but based on how Apple wants professionals to see the iPad Pro, I think it would make a lot of sense. What amazes me is people continue to be loyal to such a company and their brands, giving them the money to control the market when other companies, if given the chance, would likely respond to consumer desires much more quickly. I’m sorry but I can’t give my loyalty to a company that is so egotistical and self-focused. If you believe that the future is mobile, you REALLY don’t want Apple adding a mouse to the iPad. The reason is that with a mouse, software vendors do not have to re-imagine their apps for multi-touch. This is a big problem for Surface. Because software vendors do not have to rethink their apps to run on Surface, the next generation of software will not be designed there. If Apple holds out (and I think they will), Apple will have a complete set of truly mobile apps to go into the future with. Especially when your phone IS your computer and it streams high-resolution 4K or better video to whatever nearby multitouch screen you decide to work on. It’s not just a mouse that the iPad needs… It also needs the ability to use keyboard modifier keys. So, like… hold down the option key to select more than one item in a non-concurrent fashion. Ex: Selecting both column A and column D in a spreadsheet. The irony is that the iPad has all the gubbins necessary to do this – if you jailbreak one it supports BT mouse and it transforms usage entirely. The pencil however is an excellent alternative and does things a mouse can’t do – such as free form writing. So then you’ve have to have both a mouse and a pencil. OhBrother – nothing forces anyone to buy Apple’s products – other companies make cell phones, tablets and computers – everyone has a free choice. But Apple’s success suggests they are doing something right. As Jobs once said, if they get it right maybe people will buy their products, if they get it wrong then they won’t.